Quality Assurance Manager for MyEclipse and Webclipse. Spring’s annotation based MVC framework simplifies the process of creating RESTful web services. 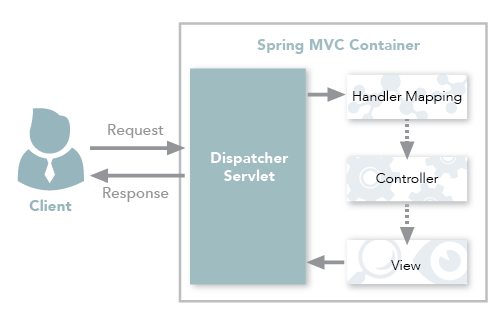 The key difference between a traditional Spring MVC controller and the RESTful web service controller is the way the HTTP response body is created. While the traditional MVC controller relies on the View technology, the RESTful web service controller simply returns the object and the object data is written directly to the HTTP response as JSON/XML. For a detailed description of creating RESTful web services using the Spring framework, click here. • The Handler Mappings section defined in the application context file tells DispatcherServlet which strategy to use to find controllers based on the incoming request. • Spring MVC supports three different types of mapping request URIs to controllers: annotation, name conventions and explicit mappings. Configure Spring support for the project. • If you are using Eclipse IDE, you need to download all Spring dependencies and configure your pom.xml to contain those dependencies. • In MyEclipse, you only need to install the Spring facet and the rest of the configuration happens automatically. Notice the @ResponseBody added to each of the @RequestMapping methods in the return value. • <context:component-scan> activates the annotations and scans the packages to find and register beans within the application context. • <mvc:annotation-driven/> adds support for reading and writing JSON/XML if the Jackson/JAXB libraries are on the classpath. • For JSON format, include the jackson-databind jar and for XML include the jaxb-api-osgi jar to the project classpath. Deploy and run the application on any server (e.g., Tomcat). If you are using MyEclipse, you can run the project on the embedded Tomcat server.